The capital of Michigan, Lansing’s rise from a sleepy village amidst a dense forest to urban metropolis has not been easy. The original settlers of Lansing were actually the victims of fraud. In the mid 1800’s, land surveyors from non other than Lansing, New York, returned from the forests of Michigan and told tales of a large town, complete with a church and a town square. They sold several plots of worthless land and sent the unsuspecting owners off on a journey to a place that did not yet exist. These unfortunate settlers made the best of a bad situation and carved out a small town after they arrived. Their perseverance paid off, as the war of 1812 against the British forced the state to move their capital inland from Detroit to Lansing. Lansing lawyers can help you with personal injury litigation, criminal law, bankruptcy, real estate transactions, wills and trusts, and many other legal issues. Lansing attorneys recently settled a case in favor of a former Community College employee. The employee claimed he was wrongfully fired from his job for whistle-blowing on wrongdoing by the faculty. 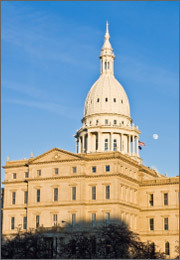 Attorneys in Lansing are familiar with the Lansing District Court and the Ingham County Circuit Court. Experienced Lansing lawyers know the court rules, court staff, judges, and other attorneys who work in the court. The local experience could come in handy if you have a case in Lansing. If you need an attorney in Lansing, consider using LegalMatch.com. Our free and unique service will match you with a pre-screened Lansing lawyer. You can also rest assured that every attorney you will speak with through LegalMatch.com is in good standing with their local bar and has an excellent reputation. Don’t take our word for it: see for yourself with exclusive attorney background information available only through our service.